Consolidation is the Japanese answer to the current economic crisis, especially in the technology sector. The Nikkei, basically Nippon’s Wall Street Journal, today reports that electronics giant NEC Electronics and Renesas Technology are currently negotiating a merger with the aim of closing talks by the end of this month. The result would be a real heavyweight: The biggest chip maker in Japan and the No. 3 in the world, worth $12 billion. The companies see the merger as the only way for survival in that competitive market. Renesas, currently No. 2 in Japan, is a joint venture between Hitachi and Mitsubishi Electric (NEC Electronics is the No. 3). 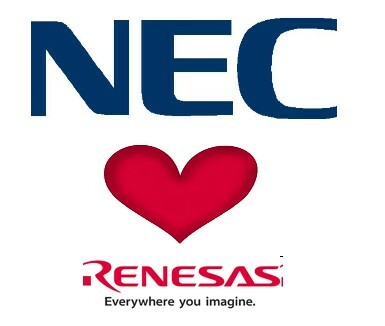 If everything goes according to plan and the companies merge in April 2010, Renesas will become part of NEC and NEC will live on as a brand and stay listed as such at the Tokyo Stock Exchange. The Nikkei says NEC and Renesas representatives declined to comment, but the merger would be no surprise. NEC expects to post a $650 million net loss in the Japanese fiscal year (that ended March), while Renesas even expects a whopping $2 billion loss in the same time frame. Japan’s current top chip maker is Toshiba. Intel and Samsung are the global leaders in the semiconductor market.